Discussion in 'Ride Reports - Epic Rides' started by ChrisUK, Mar 13, 2014. My riding buddy for my second attempt on the BAM: Mr Felix "I make Kevin Keegan's and Chris Waddle's mullet look good" Wright. Myself, Felix and Phil had already met in the UK and agreed to ride the BAM together. Various events had conspired to prevented this from happening up until now. Russia and Siberia have many positive aspects, but the mullet haircut, that many local men sport, is not one of them. I suppose their 1980s haircuts go with their love of 1980 heavy metal music. Spare tyres are also the (b)right size for tasty Baltika 7 cerveza cans purchased at the bottle shop en route to the hotel I stayed at twice already on the Transalp Mark I.
Btw, posted this yesterday and it just disappeared..spooky. The road to Zhigalovo was ridden by both Chris and myself for the third time. 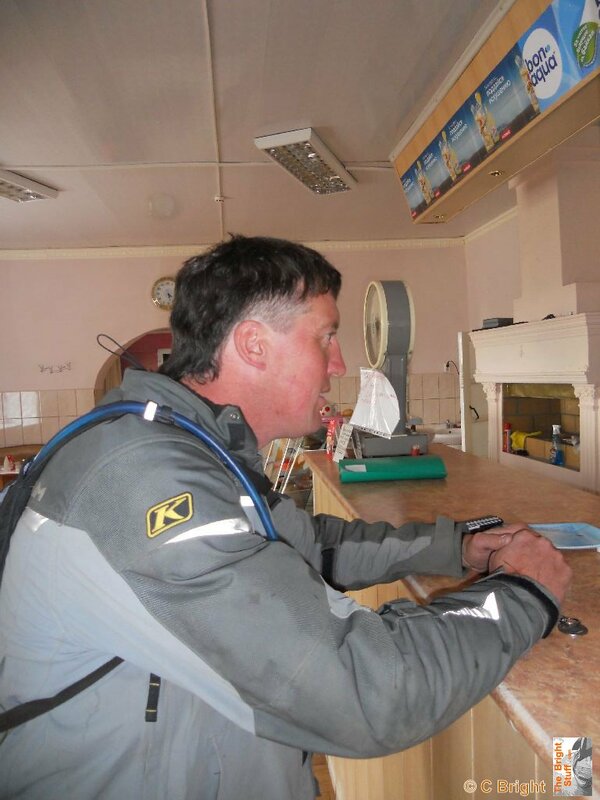 A few days earlier Phil and I had set off from Irkutsk at a slower pace than usual. Obviously he was thinking of other things. The paved road towards Zhigalovo - shortly afterwards he pulled up and decided he needed to get back to Irkutsk for some "Russian lessons" with the lovely Zarina. Lunch a week earlier on Baikal. Phil and Zarina are now happily married. By now it was time to leave the "architecture" behind and take the mullet on the BAM. This is shaping up to be an epic adventure! Write on! To be honest Felix, if I had the choice between riding with you or learning Russian with Zarina, I wouldn't have left Irkutsk either. Although what she sees in the (self proclaimed) only gay bloke from Stoke, I have no idea! At the BAM road sign (The same one as on the MarkI Transalp). The MarkII travelled all the way from somewhere in the middle of the Russian Altai, then across Mongolia, from Ulaan Bataar to Irkutsk and along the BAM to Tynda, then to Yakutsk and Magadan, including crossing 2 borders, without a licence plate! Why? Why not, nobody bothered checking and no police stopped me/us. Phil had dropped the bike backwards into a hole in the Altai, (that apparently took some heavy lifting equipment to extract 48 hours later: Felix or Phil might be able to elaborate on this story) and he lost the rear turn signals and plate. I did try making a new plate in an internet cafe in Irkutsk and cable tied it on, but after an hour it was falling off, so it spent the rest of the journey sticking out of my camelbak. Memo to self: When Phil says the spare tubes in the panniers are fine, check that they haven't been patched, and if they have, buy some new ones in the bike shop in Irkutsk before leaving! The pleasant weather and easy road, so far, lulls you into thinking this ride will be easy. Just for information: The trail gets progressively harder until Lopcha, over a thousand miles away, when it's back to easy gravel for the cruise into Tynda. Too much alcohol in Severobaikalsk. Food shopping in Severobaikalsk. What a ridiculous bloody haircut! Stopping for an ice-cream in a railway town. I ate more ice-creams on this trip than on many others. Seasoned Russia travellers are familiar with what we term "haircut risk" when travelling for extended period in the risk zone (former Soviet Union). Its a greater risk in Siberia and seems to be correlated to the distance one is away from Moscow. While risks can be somewhat minimised by taking precautions, I can assure you from personal experience, the risks can NEVER be eliminated. Its a risk factor one simply has to bear in mind when travelling across Russia. Fortunately, as motorcycle riders, we are often protected from the potential humiliation by wearing helmets. Again the open face helmet is superior as you almost never have to take it off, thus concealing the abysmal haircut from as many potential guffawing ladies as possible. I myself would only take the helmet off to shower and sleep. And if I had picked up Felix's mullet, then I might not even take it off for that. It can be especially dangerous if you confront a mirror, and a good riding buddy should always walk ahead of the afflicted rider in hotels, warning of upcoming mirrors. This gives the afflicted rider time to don his helmet before confronting the mirror, which in turn helps to avoid the trip stopping "Loss of Mojo". Felix's Russian skills at the barber shop weren't good enough when the lady said "That'll be a mullet then sir?". And I see the timing of the haircut incident was most unfortunate. Just when you wanted to be looking your sharpest & coolest, ... you were handicapped by that unfortunate haircut. She wanted him for herself,so the cut that only a stylist could love. And if I had picked up Felix's mullet, then I might not even take it off for that. Having what's called a "reverse mohican" myself ( aka slaphead), I went to a barber shop in Yakutsk, for "your best number one crewcut, young man" and the man with the clippers most definitely batted for the other side! I must stress I escaped the city unscathed! Fortunately I got "mulleted" 10 minutes before we set off for the second time for Zhigavolo. I think it was a subconscious statement of intent that it was time to leave Irkutsk. It's the type of place, certainly in the summer, that a tired adventure motorcyclist can relax, eat well and drink some cold beers while taking in all the sensory delights before continuing on his arduous journey. If you go make sure you stay a few days. But avoid the hairdressers round the back of the Angara Hotel next to the car park. Oh yeah: The pic above of the X-Ch riding through the water is not a river! 4. Where (on my Mark I trip the week before) one evening in the cafe next to the hotel, I was struggling to mime a pig to say I wished to purchase some fried pork. The youngish lady didn't understand. The Russian translation/phrases app on my smart phone couldn't translate pork, but did have the word "porker", which was rather unfortunate considering her physical appearance She seemed unconcerned as to why I burst out laughing! One of my favourite images of the trip. When I showed this to my uncle he asked "Why are you riding though the swamp? Why not ride on the road?" 2 minutes 30 seconds. Not the fastest, which I think is Iker from the Basque Country in 40 something seconds, nor the slowest which was Tony Pettie who encountered a huge storm half way across, so had to lay himself and his bike down and wait for it to pass! We had perfect conditions in comparison!